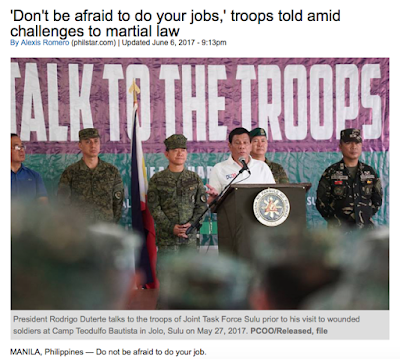 Week three of marital law started off with another pep talk by Commander-in-Chief Duterte encouraging the AFP to not be afraid to do its job. So the AFP has the Matue group on the run. 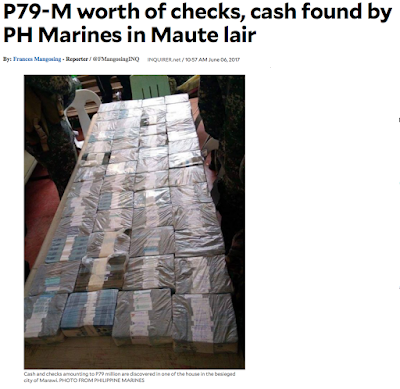 But who gave them 79 million pesos in checks and cash? Who armed them? Justice Secretary Aguirre thinks there is a vast conspiracy headed by the likes of Senators Bam Aquino and Antonio Trillanes along with other opposition leaders to destabilise the government. 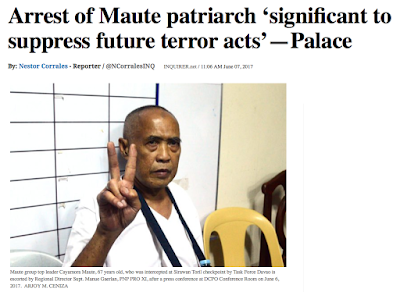 The theory goes that the Yellow party is arming and funding the Muslim terrorists and using them to throw the country into chaos and discredit Duterte. 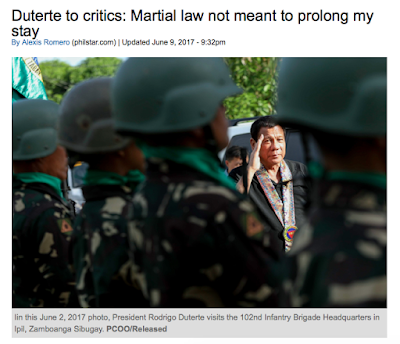 Duterte assured the nation once again that declaring martial law was not meant to prolong his stay in power. Is anybody reassured by his reassurances? 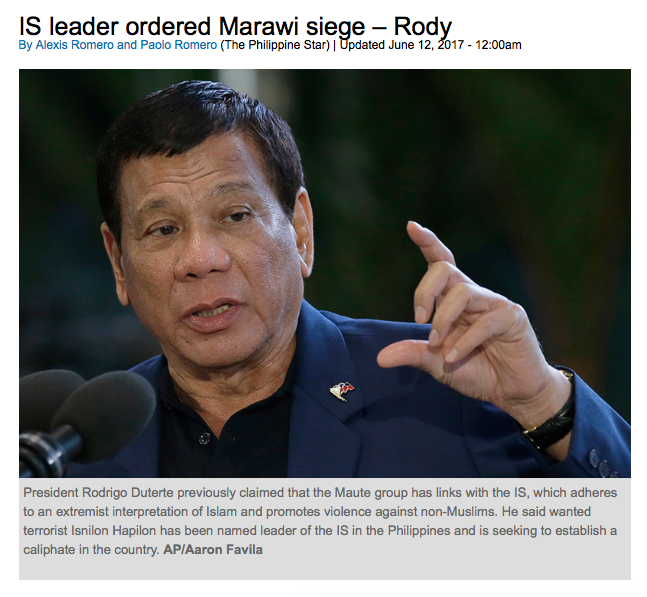 He said he would declare martial law. Then he said he wouldn't do it. Then he did it. 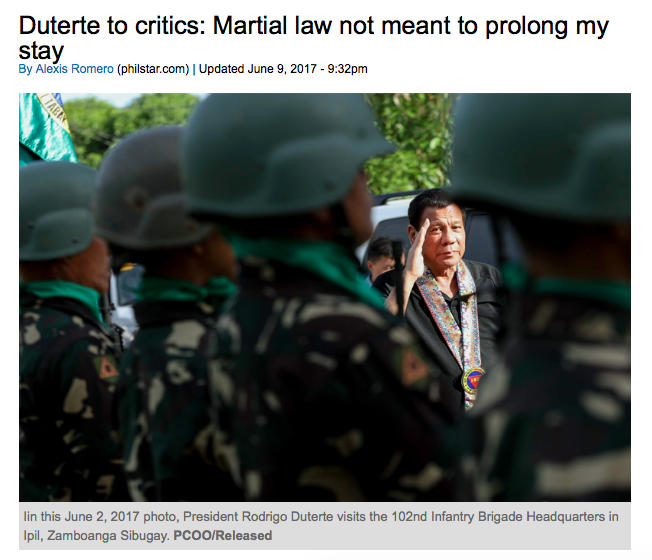 Surely he won't prematurely end the declaration of martial law before Marawi has been reclaimed. 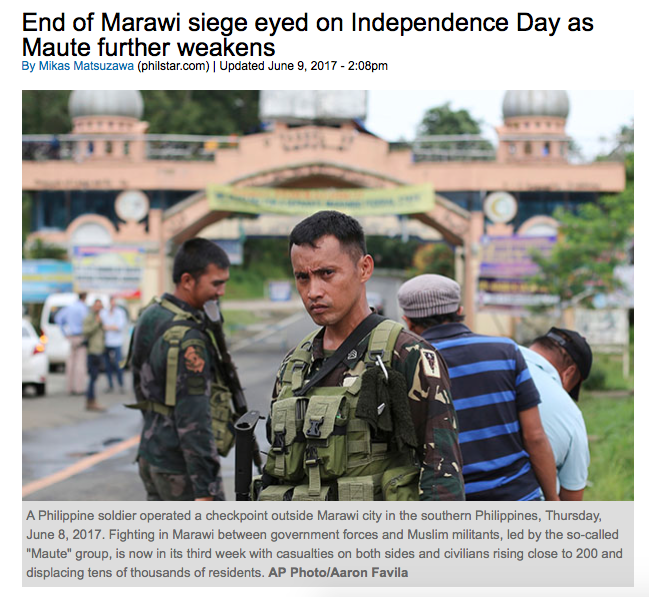 But when will the AFP finally retake Marawi? A bit premature. How about the AFP just focus on the fight and forget about arbitrary deadlines? The enemy is deadly and they do not have a timetable for victory. They will fight to the last man. It's what they have been ordered to do by the leader of ISIS himself, Abu Bakr al-Baghdadi. “We had known all along the buildup here in Marawi. 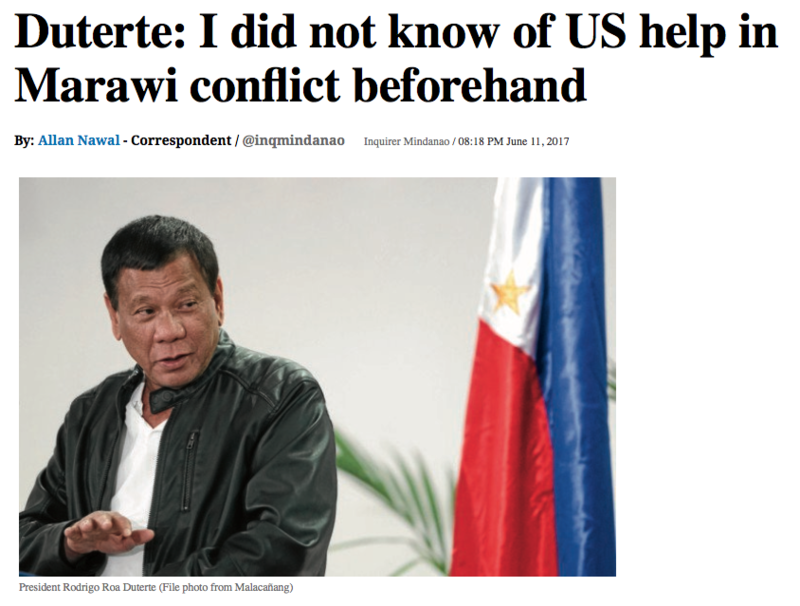 That is why if you were tracking my statements in public, (what I said) was, ‘Do not force my hand into it.’ Because there were already terroristic acts… the victims were innocent men and women and children,” Duterte said. Duterte claimed that the drug problem was used to divert the government’s attention away from the terrorists. “Sabi ko, nilululong mga tao natin sa droga. 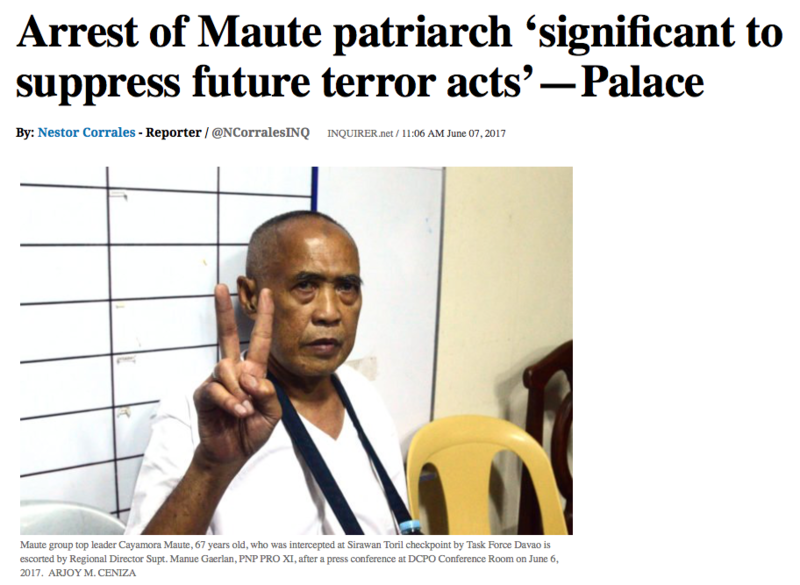 Dito sa Mindanao, ’yung Maute, simpleng pangkaraniwang negosyante. ’Yun pala, sige sila produce ng shabu para magkaroon ng problema ang gobyerno at ma-divert ating attention (They are trying to make drug addicts out of our people. 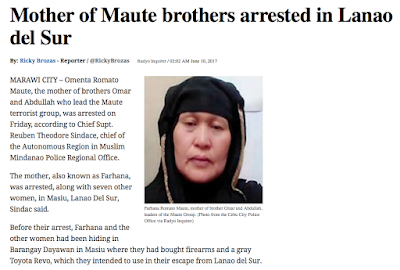 In Mindanao, we thought that the Mautes were just simple businessmen. 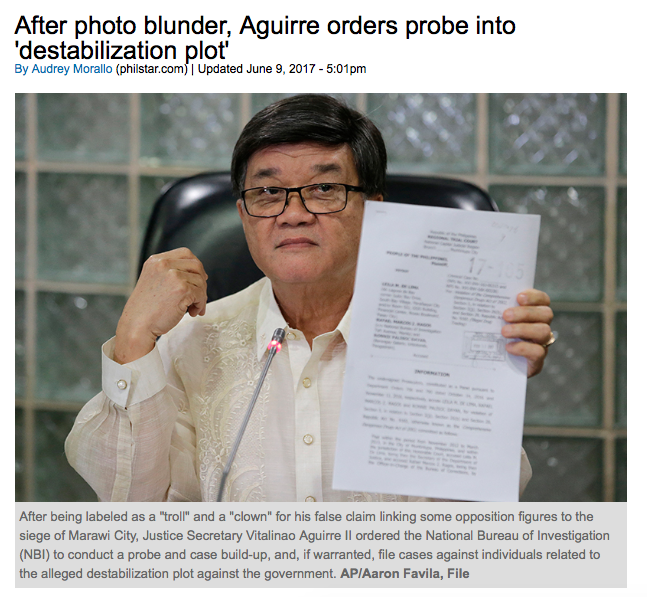 It turned out, they were producing shabu, so the government can have a problem and be distracted),” he said. 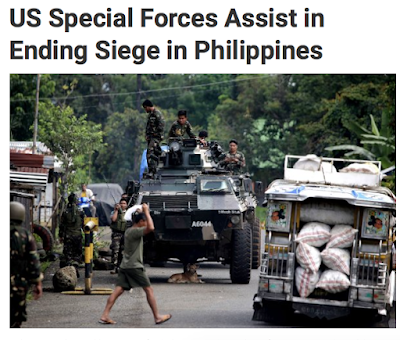 So the government knew about the terrorist problem in Marawi but it turns out that ISIS was manufacturing shabu to addict the people so the government would wage a war on drugs and get distracted from the ISIS problem which the government knew was already there but repeatedly did nothing about?? Are we really supposed to believe such patent nonsense?? 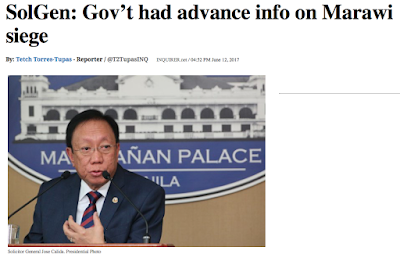 Especially when the government now claims to have known that a siege on Marawi was being planned at least a week before it happened!!?? As early as May 18, the government already received information that the local terrorist group Maute is planning to raze Marawi City, hoist the ISIS flag and declare Marawi as an Islamic territory. What else is the government lying about? What else are they hiding from the public? 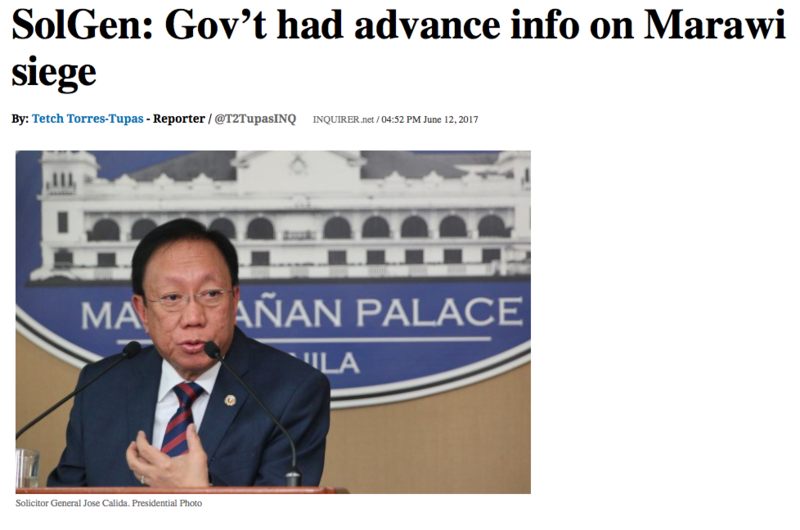 What is going on in Mindanao and what is happening in the halls of Malacañang Palace? 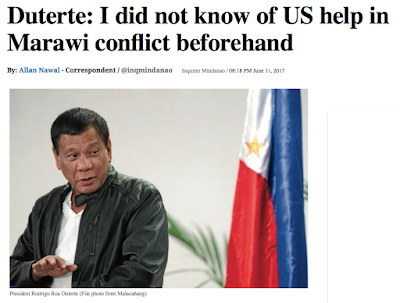 Statecraft and stagecraft on an unprecedented level that Filipinos are not used to and which has easily led them to believe anything Duterte tells them.